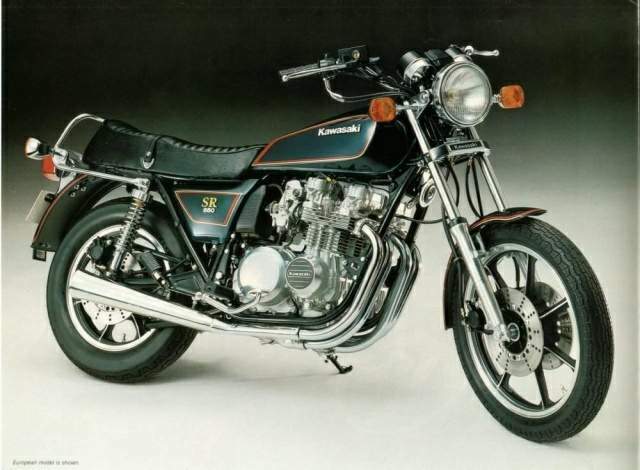 Rumour was that the SR stood for 'Stateside Replica' and this was what Kawasaki thought a replica should be! It was basically a C3 with slightly 'chopper' styling. Chrome plating was used on the headlamp shell, clock lowers and chain guard. The rear tailpiece was dropped in place of a painted rear fender. The front exhaust downpipes were crossed over and the mufflers were made a bit shorter. The rear wheel was now a small but fat 16-inch item for that all-important custom look. In America there was also a D1A model in 1978 and an E model in 1980, which were very similar but did not have as much equipment. The D2 also got the drilled brake discs and sintered pads from the C3 model of this year as well as the new "automatic" cam chain tensioner as in the B3. 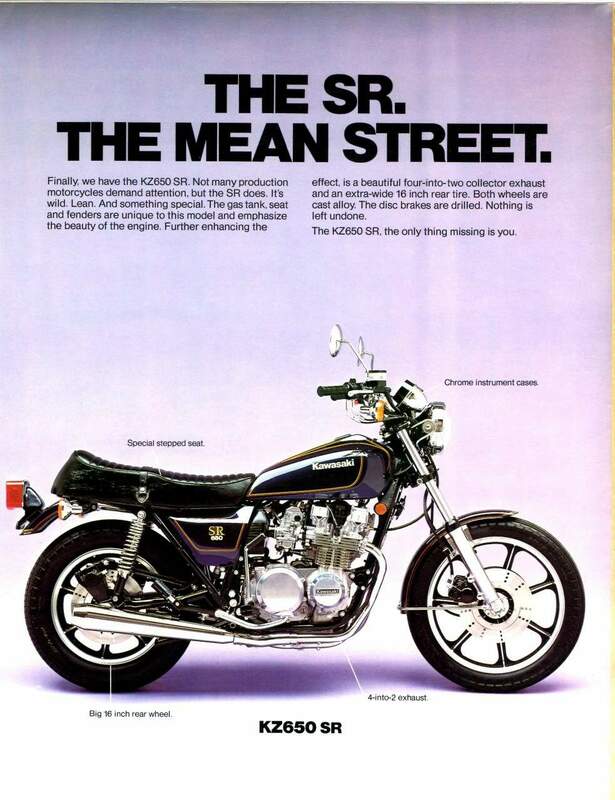 The SR uses the same 652.1-cc doubleoverhead-cam four-cylinder four-stroke engine as the standard KZ650. The internal specifications are identical, as is the hank of 22mm Mikuni slide/needle carburetors. The torque and horsepower charts in the 650 shop manual claim that the SR has fractionally less power than the standard KZ, although the only difference between the two is the SR's 360-degree, crossover-style exhaust system. This system should deliver more power than the standard pipes, but evidently it doesn't.